Wildflower Mindfulness is a mobile-based meditation program that aims at reducing stress and enhancing well-being. 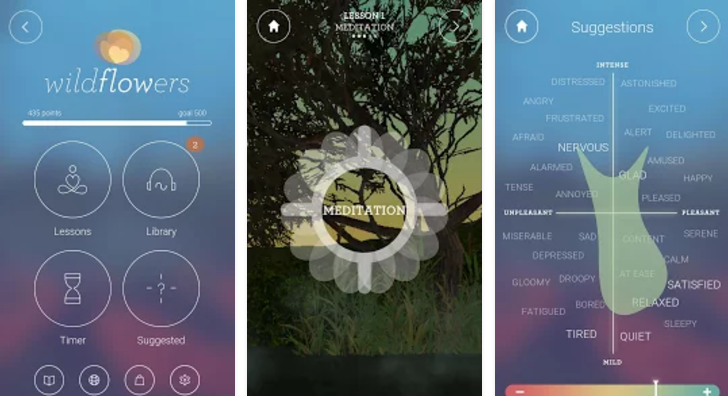 Exercising a Mindfulness-Based Stress Reduction (MBSR) protocol, Wildflower Mindfulness blends guided audio meditation with visual features, biofeedback, and information about the connection between body, mind, and meditation. Before and after each audio meditation, the app measures the user’s heart rate and other biometric responses via the mobile device camera (no external accessory needed) and obtains self-reported data on the user’s state. As the program learns about the user’s state, the “Suggested Meditations” feature provides a list of suitable 5–10-minute guided meditation audios. The app’s journal feature can be used to track progress and changes in measured heart rate and self-reported moods. Low price/ Objective monitoring/ Good selection of meditations. Overly complicated, with meditations not receiving the main focus. Wildflower Mindfulness is a meditation app suitable for all ages (teens and up) and levels of experience. Reasonably priced, the program provides a good selection of professional and pleasant meditations. However, the program’s incorporation of interactive features (e.g., heart rate measure, mood report, game, etc. ), informational features, and meditation are not best suited to its purpose. Although the different features offered in the app are well designed and based on clinical information, the program’s flow does not consider how users would utilize the app in the context of their daily routine. The features create unnecessary complications and potentially distract the user from the main objective of meditation. For long-term use, this main objective should be the focus of the app. The app’s tutorial, though clear, does not provide sufficient guidance on how to use the program. Thus, most users will probably have trouble grasping how the program developers intend for the program to be used. That being said, this program could be beneficial for users who strive to proactively learn about the link between mindfulness and their own stressful experiences, as most other mindfulness programs do not emphasize this type of learning. The main advantages of using Wildflower Mindfulness as an adjunct to treatment are its affordability (compared to other similar meditation apps) and its incorporation of biometric feedback. This program could be beneficial for those who strive to proactively learn about the link between mindfulness and their own stressful experiences. This learning process could be enabled through the use of the “snapshot” at the beginning and end of each practice. The therapist can include in-session mindfulness practice and examination of the patient’s progress by reviewing the journal. For patients seeking ongoing mindfulness practice with the purpose of enhancing their wellbeing, however, this program as described may be overly complex, and other programs may offer a better fit.